3. IR CABS: This download contains both stock and IR cab versions. We think they both sound great, but if you’d like to use the specific IR we used, it’s from the ATyp 2×12 IR Set from Live Ready Sound (link below). Here is the specific IR: LRS M2 ATyp SM7b 02 (from the A Type 2×12 pack found here). In our Helix, it’s in IR slot 49. 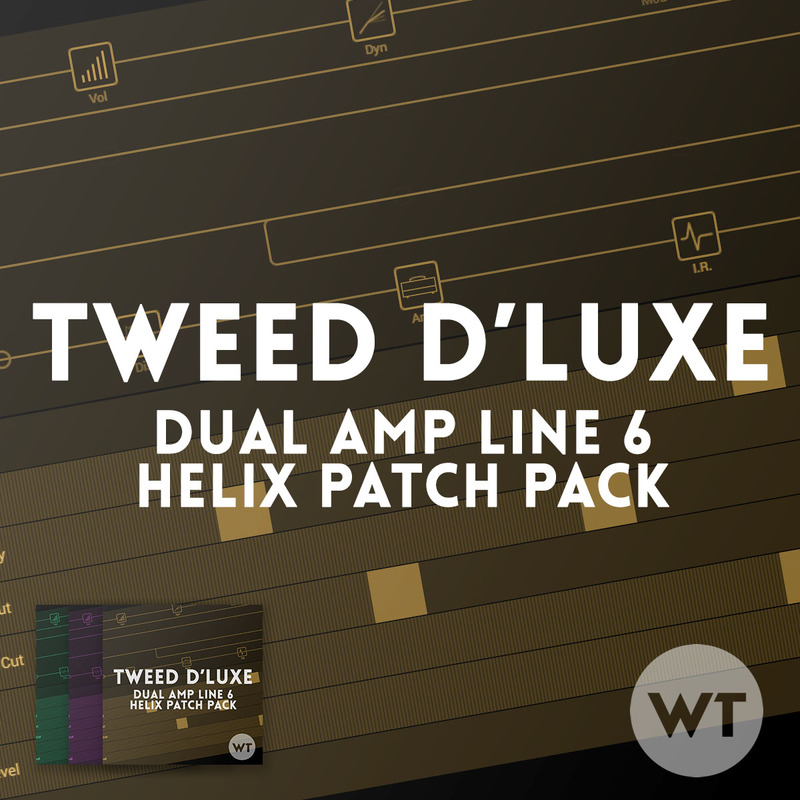 Tweed D’Luxe (stock and IR versions): These patches include both the Tweed (Champ) and Deluxe amp models in a dual amp setup. Tweed (stock and IR versions): These patches include just the Tweed amp. D’Luxe (stock and IR versions): These patches include just the Deluxe amp. The effects layout and snapshots are similar between all the patches – although settings have been tweaked to sound best with each setup. Feel free to experiment. We don’t think one sounds necessarily better than the other – just different. We set up the Tweed to sound pretty dirty even at it’s cleanest settings – just like how the real amp sounds best. Feel free to stack drive pedals for bigger sounds. The OCD is going to be the biggest drive tone, and the other drives are lower gain. The quarter and dotted 8th delays are set up in parallel, so they will not interact with each other. This creates more of a rhythmic delay rather than a wash.
We put a 2nd compressor (LA Studio Comp) at the end of the chain. This replicates what many recording engineers will do by adding a light level of compression to the final guitar signal. It will even out your tone when switching to higher gain sounds, and just fattens everything up. Snapshot 2: Verby Clean – more reverb. Snapshot 6: Dad Rock – Big distortion (in the Deluxe Patch, this snap is called ‘The Edge’ and has U2-type delay with light drive). Snapshot 7: P&W Lead – big drive, delay, and verb.